Bring Me the Head of the Machine Gun Woman (Tráiganme la cabeza de la mujer metralleta) hits selected UK cinemas on 27th September before becoming available on DVD & Blu Ray via Clear Vision on 7th October. Bring Me the Head of the Machine Gun Woman , a pulpy low budget Chilean feature, is the deftly amusing film which Robert Rodriguez has spent his entire career trying to create. The tale is a simple one - the titular Machine Gun Woman is the most sought after hit-woman in South America with a bounty of $300 million placed on her head. She's dangerous and ruthless in equal measures, her lack of clemency matched only by her aversion to sensible outfits. Played by Fernanda Urrejola, a real life former synchronised swimmer, the Machine Gun Woman is as powerful as she is flirtatious with lines as slick as her perma-oiled cleavage. Despite having some of the most skilled hoodlums in the underworld dispatched to kill her, the Machine Gun Woman makes light work of each would-be assassin all whilst wearing a pair of killer heels. Yet, after accidentally overhearing a conversation with the city's most dangerous criminals, it is left to nightclub DJ and mummy's boy Santiago (Matias Oviedo) to bring her in - his punishment from the gangland bosses for failing to achieve this is death. In over his head, it's not long before the DJ finds him self quivering at the Machine Gun Woman's heels - how can he overcome this impossible situation? Clocking in at a lean 73 minutes, Bring Me the Head of the Machine Gun Woman is a fantastically enjoyable, pulpy, schlocky piece of retro fare which manages to successfully blend 1970s style exploitation cinema tropes with computer game visuals and narrative - imagine Grand Theft Auto or Scott Pilgrim as filtered through a Latino grind-house movie. Whilst those unaccustomed to the more crass and uncouth end of the exploitation genre may find a couple of scenes rather unsavory, and some may question why not a single woman appears fully clothed in the movie, Ernesto Diaz Espinoza's film is bound to find a keen and appreciative audience. 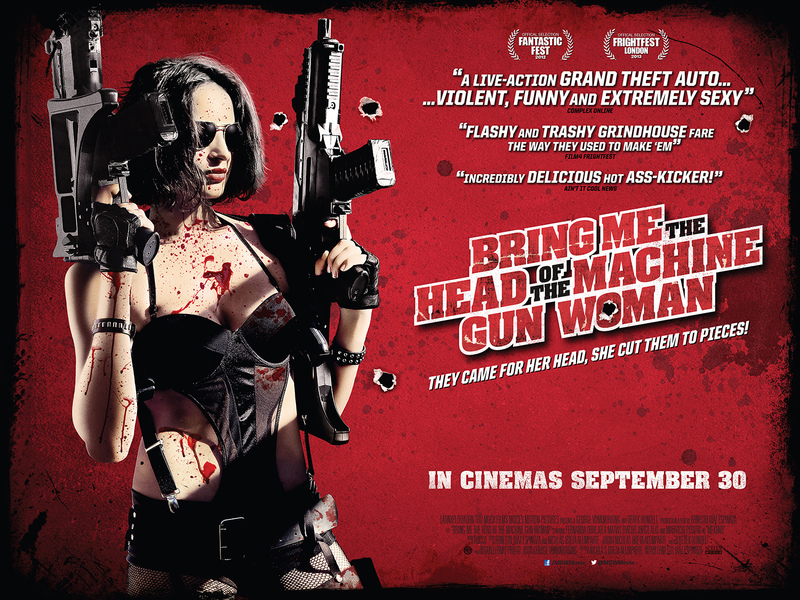 Powered on by a heavily synthetsised, minor key score and game performances from all involved (Urrejola deserving the main plaudits for her sassy and ludicrous lead turn), Bring Me the Head of the Machine Gun Woman feels much more authentic than many of its contemporary grindhouse peers. A bombastic, retro triumph. You have that outfit? You're very brave!